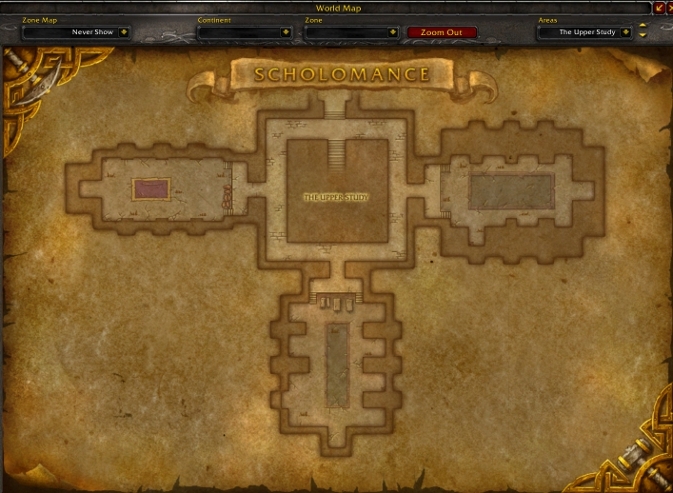 Scholomance is a 5-man dungeon located in the Western Plaguelands. 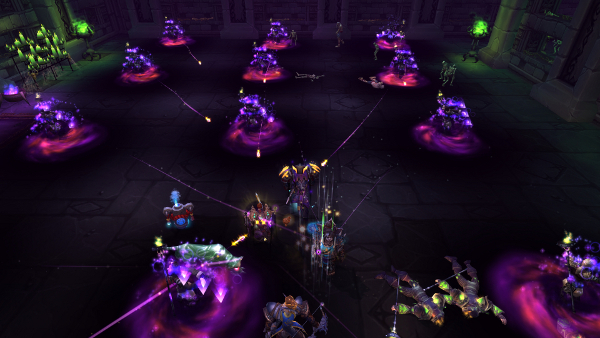 In Mists of Pandaria, it has been revamped to include a level 90 Heroic mode. It houses 5 encounters: Instructor Chillheart, Jandice Barov, Rattlegore, Lilian Voss, and Darkmaster Gandling. 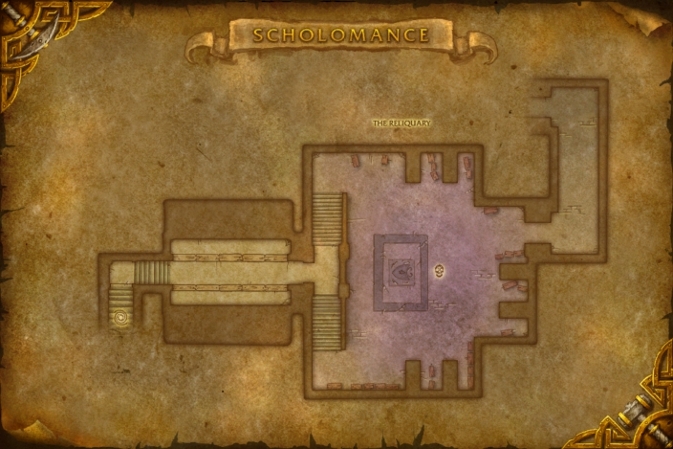 Scholomance is a 5-man dungeon located within the ruined keep of Caer Darrow in Western Plaguelands. With Mists of Pandaria, the dungeon has been revamped and now features a level 90 Heroic mode. Scholomance is a place of learning for necromancers and your goal is to put an end to their activities. The dungeon has a linear layout during which you will descend through 3 sub-zones, until you reach Darkmaster Gandling. 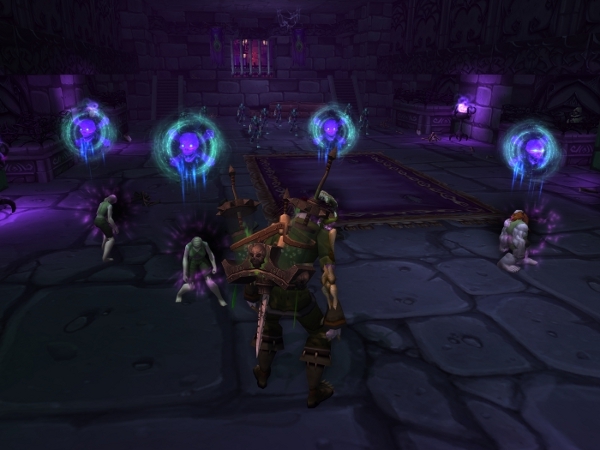 For level 90 players, only the Heroic mode of the dungeon will be of interest. This guide will cover all of the five boss encounters, as well as the quests and achievements that are available in the dungeon. 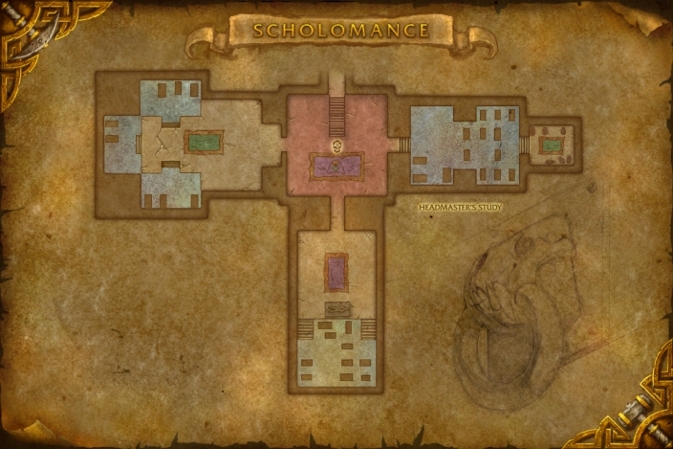 The level of the items you can obtain from Scholomance is 463, with one exception, Headmaster's Will, which has an item level of 476. There are 2 quests that can be completed within the instance. They are both given by the Talking Skull, a strange NPC that follows you through the instance. The first quest is The Four Tomes, which requires you to pick up books as you progress through the instance. Looking at the quest objectives on the map should be more than enough to find the books. The second quest is An End to the Suffering, which requires you to kill Darkmaster Gandling, the final boss of the dungeon. Only An End to the Suffering has rewards. They have an item level of 440 (see loot section above). The fight against Instructor Chillheart is a two-phase fight. During Phase One, you will have to burn down the instructor as fast as you can. During Phase Two, you will fight her phylactery and will have to avoid bombs and void zones. In Phase One, you are fighting Instructor Chillheart herself. As the phase progresses, you will see an Ice Wall getting ever closer to your group. The idea is to defeat Chillheart before the Ice Wall reaches your group and kills everyone. During this phase, all you have to do is focus on attacking her while making sure to spread apart 2 yards (because of Ice Wrath) and to avoid the ice patches from Frigid Grasp. Also, tanks and healers need to be respectively aware of Touch of the Grave, which causes Chillheart to deal additional Frost damage with her 10 next melee attacks, and Wrack Soul, which is a DoT that jumps from players to players. Once Chillheart is defeated, you enter Phase Two, where you get to fight her Phylactery. 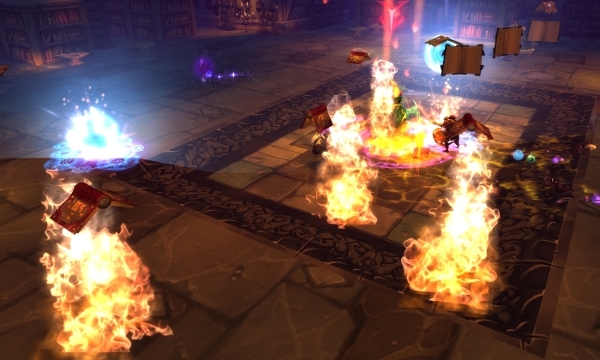 During this phase, you will have to avoid Arcane Bombs and patches of fire ( Burn). Additionally, random players will be regularly damaged by Shadow Bolt. Most of the fight is very easy. Simply avoid standing in front of Jandice Barov (because of Wondrous Rapidity) and get away from Gravity Flux, which has a very visible purple ground effect. At 66% and 33% health, she will create images of herself and hide behind one. It is important that you kill the right image, as otherwise you will receive damage from Flash Bang. The right image is the image that looks exactly like Jandice (same hair color, same earrings, etc.). To find the right image, you can mark Jandice at the beginning of the fight (with the Skull mark, for example) or you can tab through all the images and look at their portrait in your unit frames. Using the BarovHelper addon will make it very easy to spot the real Jandice Barov during the phases when she creates copies of herself. This is especially useful when trying to run the dungeon in Challenge Mode. To complete Attention to Detail, you simply need to defeat Jandice Barov without ever eliminating a false image. The encounter with Rattlegore has one crucial mechanic to which you need to pay special attention. Throughout the fight, everyone must maintain the Bone Armor buff up on them by clicking the Bone Piles around the room. The buff lasts 5 minutes and grants protection against Bone Spike, a very damaging ability that Rattlegore often casts at a random player. Being hit by Bone Spike removes Bone Armor, so the protection often needs to be renewed. 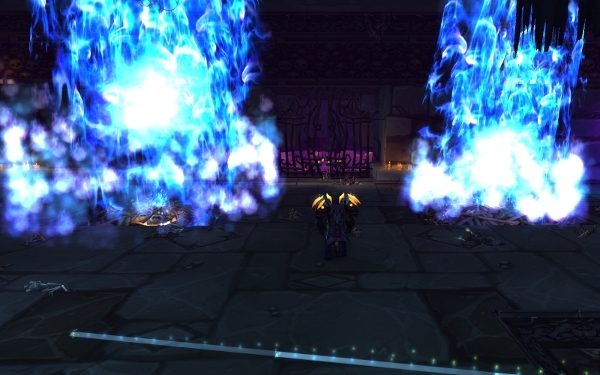 In addition, the locations where you find Bone Piles are sometimes engulfed in damaging blue flames by Soulflame, so you need to be careful not to stand in them. Finally, tanks should be aware of Rusting, which causes Rattlegore to deal increasing damage, but to move more and more slowly, as the encounter progresses. The buff lasts 15 seconds, so you will periodically want to kite Rattlegore to let the buff drop (because the buff only stacks when he deals a successful melee attack). To complete Rattle No More, your group needs to defeat Rattlegore without letting him gain more than 5 stacks of Rusting. Whenever Rattlegore reaches 4 or 5 stacks of Rusting, the tank should start kiting him around until Rusting drops. Because of the low uptime of the tank on Rattlegore, they will not manage to build much threat, so DPS players must be careful not to over aggro. In the next room, you will find Flesh Horrors. These mobs have a very large health pool, but they die as soon as you kill the 4 Meat Grafts attached to them. To complete Sanguinarian, you need to kill a Krastinovian Carver that has 99 stacks of Boiling Bloodthirst. You will find Krastinovian Carvers in the same room as the Flesh Horrors. 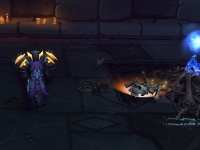 Initially, all the Krastinovian Carvers have 1 stack of Boiling Bloodthirst. 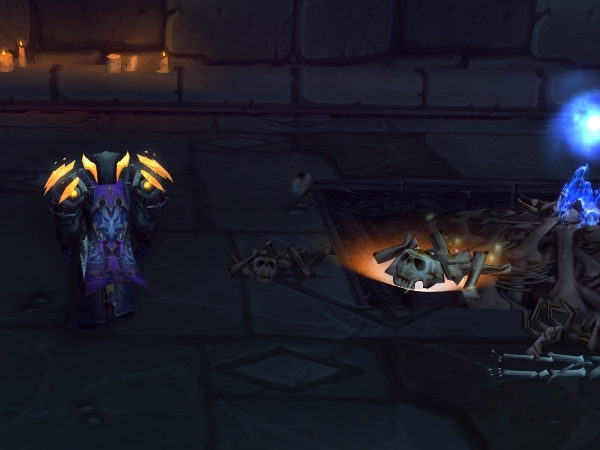 When you kill a Krastinovian Carver, its stack count is added to that of nearby Krastinovian Carvers. For example, if you are fighting 3 Krastinovian Carvers and kill one of them, the other two will have 2 stacks of Boiling Bloodthirst (their original stack count plus that of the Krastinovian Carver that just died). If you kill one of the two remaining Krastinovian Carvers, the last one will have 4 stacks of Boiling Bloodthirst. Our advice is to proceed through the room as you usually would and only kill a Krastinovian Carver if there are at least 2 other Krastinovian Carvers right next to it. If necessary, pull extra Carvers from the sides of the room. The fight against Lilian Voss is rather complex and has three phases. During Phase One, you will fight her and will have to deal with her abilities. This phase lasts until Lilian reaches 60% health. During Phase Two, you will fight Lilian's Soul, which needs to be properly kited around. This phase lasts until you get the soul to 1% health. During Phase Three, you will simultaneously fight Lilian and her soul. Both retain their abilities from Phase One and Phase Two. The phase and the fight ends when Lilian reaches 1% health. When fighting Lilian, you should spread out 8 yards because of Shadow Shiv. She regularly pulls everyone to her location with Death's Grasp. When this happens, you (and the other players in your party) become afflicted with Dark Blaze. This debuff causes you to leave a trail of damaging flames under you. You need to be constantly on the move for 8 seconds, until the debuff runs out. Other than that, the tank needs to survive her melee attacks. Darkmaster Gandling intervenes, disables Lilian, and makes you fight her soul, which cannot be tanked. The soul will fixate on a random party member with Fixate Anger. This player needs to kite the soul around and avoid being hit by it, as it triggers Unleashed Anguish. While Unleash Anguish reduces the soul's movement speed (making it easier to kite), it also causes it to cast Blazing Soul, which deals damage to everyone in the party. 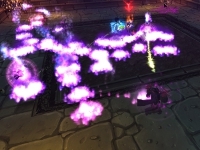 During that phase, healers can expect a significant amount of damage, because Blazing Soul is also regularly cast by the soul, in addition to being a consequence of triggering Unleashed Anguish. In Phase Three, Darkmaster Gandling reactivates Lilian and you will face her alongside her soul. They both retain all their abilities from Phase One and Phase Two, but the soul cannot be damaged. The key to success is to properly kite the soul, even when you have to run around to let Dark Blaze expire. The next room is Professor Slate's classroom. There, you will have to defeat a bunch of Bored Students. Everyone, except the tank should stand behind them because of two abilities they use: Fire Breath Potion and Shadow Nova. In the same room, you will also fight Professor Slate, whom you can pull together with some of his student packs. Watch out for Fire Breath Potion, which he casts in front of him, and Toxic Potion, which he drops on the ground where it creates a damaging poison zone. Yan-Zhu the Uncasked in Stormstout Brewery. You obtain the Polyformic Acid Potion buff by clicking the Polyformic Acid Potion object in Professor Slate's classroom (first row of desks). To avoid having to go back to Scholomance to obtain the buff again when it drops, you can loot an Empty Polyformic Acid Vial from Professor Slate. If you click the Polyformic Acid Potion object when you already have the Polyformic Acid Potion buff, you will fill your vial and have up to 3 charges. The vial changes name as you fill/empty it: Nearly Empty Vial of Polyformic Acid, Half Full Vial of Polyformic Acid, Nearly Full Vial of Polyformic Acid. In the next room, you will finally get to fight Darkmaster Gandling. 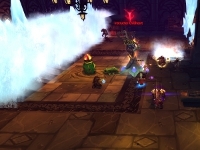 This encounter is not difficult, but individual players (including healers) are sometimes sent to a nearby room where they have to learn a Harsh Lesson and single-handedly defeat a number of enemies. You will spend most of the encounter in the main room fighting the Darkmaster. Tanks need to be aware of Incinerate, which the Darkmaster uses to deal heavy Fire damage to his target. 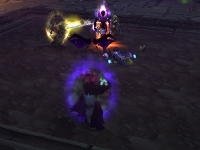 DPS players need to watch out for Rise!, which the boss uses to summon Failed Students. These students attack random party members. The channel of Rise! lasts for 26 seconds, during which time the boss takes 50% less damage. Focus on the students while the boss is channeling. When the channel is over, you can focus on the boss again and finish remaining students with collateral damage. Healers need to pay attention to the damage that Incinerate does on the tank and the damage that the students do to random players. Also, the Darkmaster will often cast Immolate at a random player, dealing large amounts of Fire damage every 3 seconds for 21 seconds. The Darkmaster often casts Harsh Lesson, sending a random player to one of the nearby rooms. There, they have to defeat a number of Expired Test Subjects. For Tanks and DPS players, things are straightforward, they just need to kill these units and come back to the main room. For Healers, things are slightly more complex. They need to gather the Expired Test Subjects close to the Fresh Test Subjects at the back of the room and then dispel Explosive Pain from the Fresh Test Subjects, this will cause a large amount of damage to the Expired Test Subjects, eventually killing them. To complete School's Out Forever, you need to defeat 50 Expired Test Subjects within 20 seconds. The main difficulty is that all the nearby rooms are closed and the only way to enter them is to wait for Darkmaster Gandling to cast Harsh Lesson on you. When someone in your party is the target of Harsh Lesson, they should not engage the Expired Test Subjects, but rather wait at the back of the room that everyone has been sent to their own room. Then, everyone should engage their Expired Test Subjects and defeat them. This concludes our Scholomance dungeon guide. If you find any inconsistency or mistake, feel free to comment or send us an e-mail.